I have been making junk journals for years now, but have only taught them a few times. Now I am not working full time, I am finding time to play again and explore the fun and creativity of junk journals. Over the past 4 months I had 12-15 ladies join me, most of them had never done any mixed media before and are all enjoying the classes. I have another page for this Saturday. We still have room for more, so you can join me and make a page for your journal or just do it as a layout. You can also do catch up classes, if you want to create the pages you may have missed. I love photo's and words so my junk journal will feature both. This class is perfect for any beginners wanting to have a go at mixed media. I will be supply the "junk" for this page. You won't need a journal or journal book for this class as each month you will make a page using different paper for your journal. Once we have enough, we will be making a book for our pages to go in. If you could bring the following items to this class if you have them. If not you can use our workroom supplies or purchase items at the class. Selection of your favourite stamps. Selection of photos to be cropped or just wait until you have done the page and choose them later. Cost of the Class $20 + $12 Kit. 10am-1.30-2pm. We are back at Cumberland Park this weekend. Friday 11th, Saturday 12th and Monday 14th of May. Join Jane and create a lovely Graphic 45 page using papers from a few of Jane's favourite collections. Perfect for School Photos. Cost of class $16 + $12 Kit. Friday 11th 10am-12.30pm. Join Jane for another Project life style class. 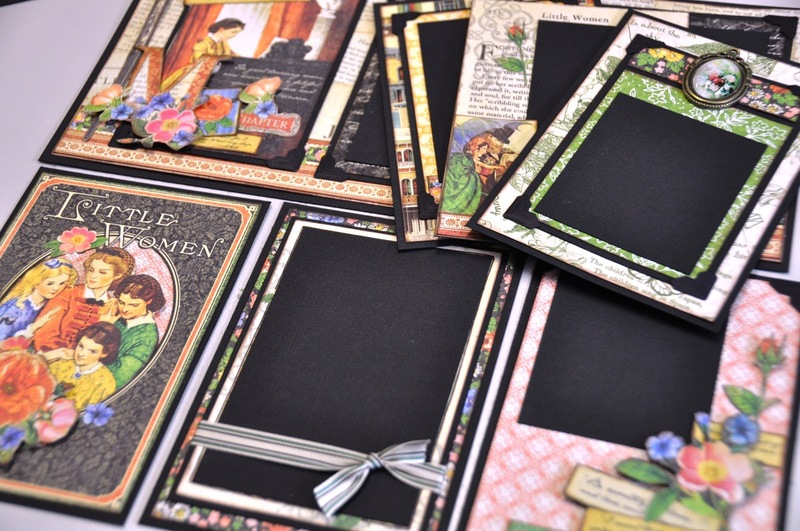 Using papers from Graphic 45's "Little Women" and papers from some of Janes other favourite collections. You don't need to bring photo's to this class, you will be able to add them later. I have another set of Patchwork pieces planned for this class. I would love you to join me for this class. Cost of Class $16 + $15 Kit. Friday 11th at 7pm-9.30pm. Cost of the evening $16 + Any materials purchased - Friday 11th at 6pm-10pm. I have been making junk journals for years now, but have only taught them a few times. Now I am not working full time, I am finding time to play again and explore the fun and creativity of junk journals. Last month I had 12 ladies join me, 6 of them had never done any mixed media before and all enjoyed the class. I have another page for this Saturday. We still have room for more so you can join me and make a page for your journal or just do it as a layout. I love photo's and words so my junk journal will feature both. This class is perfect for any beginners wanting to have a go at mixed media. I will share an image and a list of mixed media items you can bring. If you don't have them , then you can share some of mine or purchase on the day. Cost of the Class $20 + $12 Kit. 10am-1pm. Kathy has two classes planned for Monday. 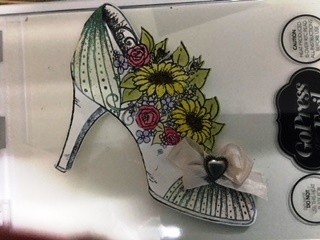 You will make two delightful shoe cards. Please bring any products you like to colour with..copies, gelatos, water colour pencils or use ours. You will need your water brush pens and Stella winka clear/gold brush pen. We will have some for you to purchase on the day. Cost of class $16 + $3 Kit. Monday 14th 10am-12am. 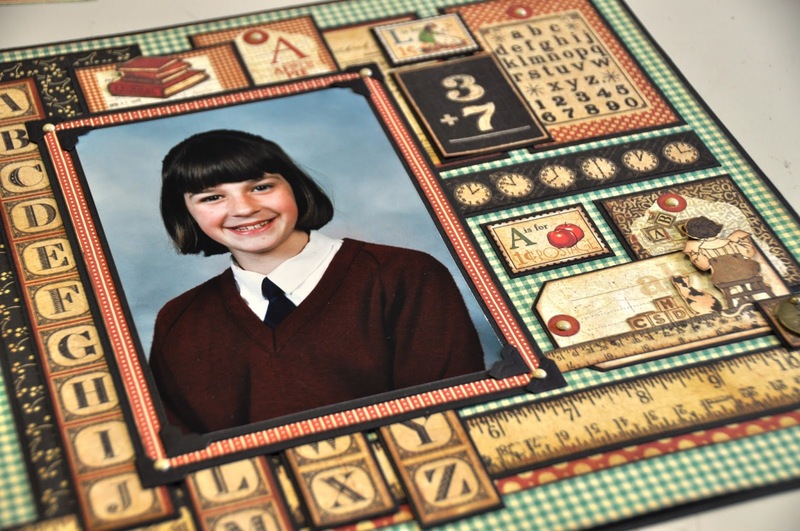 Just a sneak peak at one of the cards using the new foamariam and hot foil for your chipboard. I used pumice distress ink but creamy brown will work. 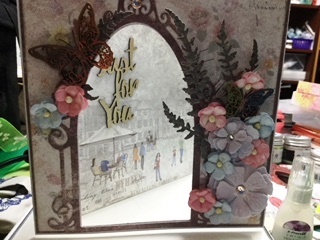 Your papers from April class (if you didn’t attend there are papers available..
Heartfelt creations die botanic window with machine or if too bulky we have extra machines. Class $16 or $30 for both classes Monday 14th May 1pm-3.30pm. I will post photos of my junk journal tomorrow. PS Remember that the three days we are at Cumberland Park I will have a large area of the room as a shop. I will be also holding a couple of classes a month at St Marys for anyone interested in joining me. Please contact me for more information.